Update: An Israeli police officer, Zidan Saif, died of injuries sustained in the shootout with the terrorist, making it five Israelis killed. Saif was from a Druze community in Northern Israel. "We are proud of our sons who act fearlessly on the front against terrorist attacks," said Druze spiritual leader Muefek Tarif. Israeli political leaders are blaming Palestinian Authority President Mahmoud Abbas for inciting Tuesday's bloody terrorist attack inside a Jerusalem synagogue that killed four people and injured eight others. The two terrorists, who carried axes and a gun, also were killed in a shootout with police. The attack took place in a synagogue in Jerusalem's Har Nof neighborhood. All four murder victims were rabbis. Three of them, Aryeh Kopinsky, Moshe Twersky, and Calman Levine, were dual American-Israeli citizens. The fourth, Avraham Shmuel Goldberg, was a British-Israeli citizen. Twersky's grandfather is an iconic figure in modern Orthodox Judaism. "This is the direct result of the incitement being led by Hamas and Abu Mazen (Abbas), incitement which the international community is irresponsibly ignoring," Israeli Prime Minister Benjamin Netanyahu said in a statement. "We will respond with a heavy hand to the brutal murder of Jews who came to pray and were met by reprehensible murderers." Foreign Minister Avigdor Liberman echoed that, saying "the responsibility rests entirely with the Chairman of the Palestinian Authority Mahmoud Abbas. Abbas has deliberately turned the conflict into a religious conflict between Jews and Muslims and the systematic incitement he leads against Jews, including his statement that impure Jews may not enter the Temple Mount, provides the guidance for such heinous attacks." Shin Bet chief Yoram Cohen, on the other hand, reportedly told Knesset members in a classified meeting that he did not agree with those assessments. The Popular Front for the Liberation of Palestine (PFLP) claimed responsibility. The slaughter drew immediate praise from Hamas and the Palestinian Islamic Jihad (PIJ). A PIJ statement called the attack "a natural response to the crimes of the occupier." Hamas spokesman Sami Abu Zuhri said it was in revenge for the death of a Palestinian found hanged in a bus Sunday night. An autopsy determined it was a suicide. "Hamas calls for more operations like it," Abu Zuhri said. "Where are they?" the attackers asks. 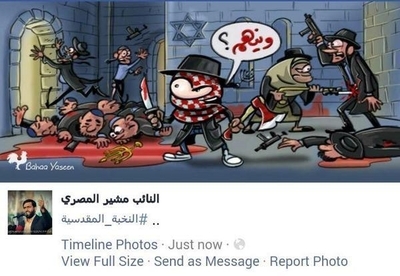 Another Hamas spokesman, Mushir al-Masri, posted a graphic cartoon on Facebook glorifying the attack on Jews as they worshipped. The attack triggered celebrations in Gaza, with people hailing the killers as martyrs, holding up axes and others passing out sweets. Secretary of State John Kerry called Netanyahu Tuesday to offer condolences over the attack, describing it as an "act of pure terror and senseless brutality" and called on the Palestinian leadership to condemn it "in the most powerful terms." Kerry also reportedly cited Palestinian incitement, including recent calls for "days of rage" and said Palestinian leaders need to tamp down their rhetoric. If all agree that the carnage is due to incitements and indoctrination, then it is time to target all the people in charge of brain washing. They are, the top five and anyone that appears on Palestinian TV or in Mosques with virulent party lines. Sad to admit, but there is no other way, that would be acceptable by humanity. This will be accepted, especially now, that the Arab kingdoms understand that the Muslim brotherhood is their real enemy and the oil outflow is finally tapering off. Most REAL Americans, hope president Netanyahu uses that heavy hand , with extreme power. Not one true american will blame him. we stand united, with isrieal! the jewist people, have used much restraint in this matter. perhaps its time, to show them what power you are really capable of. shalom, from an american. Sad Thing is There are Those Who Still Believe Him! There has never been an alternative that is both effective AND compassionate for all, the repatriation to Jordan & Egypt of the overwhelmingly genocidal Arab Muslims from the tiny strip of land west of the Jordan River. One is exceptionally cruel to the innocent to say otherwise. In fact, anyone who disagrees with peacefully legally morally repatriating this extremely hostile population is part of the problem. Of course, the only person in Israel who counts, because of Israel's poor political system that democratically elects dictators, is the Prime Minister. It would be laughable if it wasn't so deadly that he's going to do something rash. I stopped holding my breath long ago as he hasn't a clue as to how to truly stop the carnage & save Israel.